Answer: When I was a child, around the age of 5 or 6, my uncle Dave built his own telescope. He ground the glass to make its mirror, rolled a tube out of sheet metal, and fabricated a mount and tripod out of standard plumbing parts. Dave was an amateur “mad scientist” who was always working on some project or another … model planes, kites, fireworks, etc. And he was, in retrospect, something of a role model for me at the time. I still vividly recall the evening his scope saw “first light.” He had it set up in the back yard of his home in Algoma, Wisconsin (where he still lives today). The Moon was up — an easy first target. After he adjusted the scope and had his look, he let me climb a small step ladder for my own view. What I saw that night remains etched in my memory. To this day, the Moon is still one of my favorite celestial objects. Sharing stories of astronomical epiphanies is one of the fun things about being in an astronomy club. I’d love to hear some of your stories. 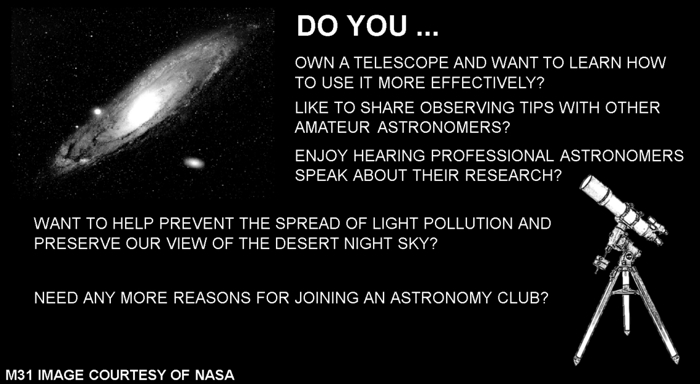 The Desert Foothills Astronomy Club (DFAC) will hold its first meeting in May. For more details, and contact info, go to our website at: www.dfacaz.org.